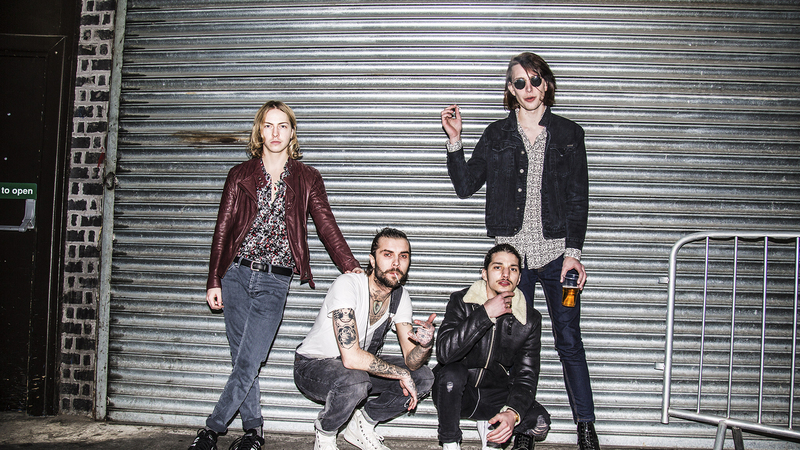 If you haven't yet heard of the heat-seeking alternative rock band, The Hunna, then you are truly missing out. After their debut single “Bonfire” dropped last year, the band officially had us hooked. We couldn't stop gushing over their nostalgic pop jams that are infused with a unique rock'n'roll urgency that somehow also harkens back to our emo days. With their debut album, 100, currently on the shelves, the English four-piece, Ryan (vocals andguitar), Dan (lead guitar), Jermaine (bass), and Jack (drums), have been super busy touring all over the UK as well as the US, selling out shows on both sides of the pond. This week the band is headed over to the West Coast for six shows in California, and lucky for us, they'll be taking over our Instagram while in Los Angeles! The “You & Me” singers will be logging in on October 29, giving us a chance to catch up with their tour fun while they just so happen to be opening up for alt-rock legends Jimmy Eat World at the Troubadour (no biggie). To pump yourself up, check out some of our favorite Insta pics from The Hunna below, and be sure to sit back and relax—it’s gonna be a good one. While you’re at it, check out our exclusive premiere of The Hunna’s live music video “Bad For You” below. The UK rockers will continue on the road through the fall as a part of AltNation’s Advance Placement Tour with Night Riots and The Shelters starting November 5, so be sure to track them on Bandsintown to see when they’ll be coming to a venue near you!